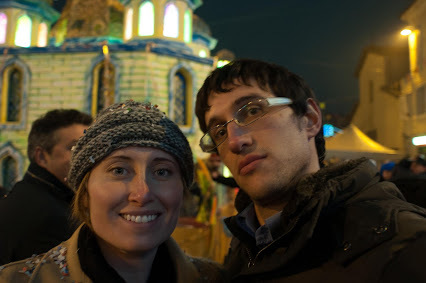 This write-up and photos are from almost a year ago, Carnevale 2012, but they never made it up. I’m trying to upload old pictures and the accompanying stories now with back dates so they are archived in order. Today we continued breaking me into the Canevale tradition with a different style celebration. 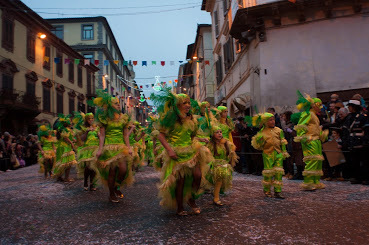 The town of Ronciglione has the oldest Carnevale in central Italy, dating back to 1465. Because it has such a rich history, they put on a big show and Italians come from hours away to see the parade in this small medieval town. The town has a population just under 9k people and 1,200 of them participate in the parade. They are broken down into different “Mascherte” of themed costumed groups with floats and parade down the main street for two hours. There are also a few horses, but nothing like what we saw yesterday in Rome, just a few and not nearly as well trained. The town used to hold unmanned races, like the ones on Rome’s Via del Corso. While the ones in Rome stopped in 1874, these continued just until last year. During the 2011 Carnevale a horse died in the race and due to the up cry after, the races no longer take place. This is one of the biggest Carnevales in Italy. It gets super crowded and we were warned about going there on Sunday, the most popular Carnevale day (you would think Fat Tuesday, but lots of people are at work). However, lucky for us (I guess) it was raining and Italians hate to go out in the rain. So, there were less people than normal. I thought there were a lot of people, but the MC said we’re “few but good”. Unfortunately there was going to be a show in the morning that was canceled because of the rain, so, we missed out on that and ended up with a lot of time to kill until the parade in the evening. Luckily it was a really cool medieval hill town to walk around and the rain was just an on and off drizzle. Italians really do hate the rain. I simply want to tell you that I am just beginner to weblog and seriously savored your web blog. Almost certainly I’m want to bookmark your website . You surely come with impressive article content. Cheers for sharing with us your web-site. I seriously love your blog.. Pleasant colors & theme. Did you build this amazing site yourself? Please reply back as I’m hoping to create my very own blog and would like to find out where you got this from or exactly what the theme is called. Kudos! I simply wish to reveal to you which I am fresh to blogging and undeniably adored your site. Very likely I am likely to bookmark your blog post . You indeed have extraordinary article reports. Delight In it for share-out with us your internet site document. I simply want to notify you that I am certain raw to putting up a blog and completely liked your page. Probably I am likely to bookmark your webpage post . You indeed have memorable article subject. Acknowledge it for giving out with us your site report. Absolute engaging advice you have said, a big heads up for publishing. Great goods from you, man. I have understand your stuff previous to and you’re just extremely fantastic. I actually like what you’ve acquired here, really like what you’re stating and the way in which you say it. You make it entertaining and you still care for to keep it smart. I can’t wait to read far more from you. This is really a great website. Truly informative points you have mentioned, a big heads up for publishing.